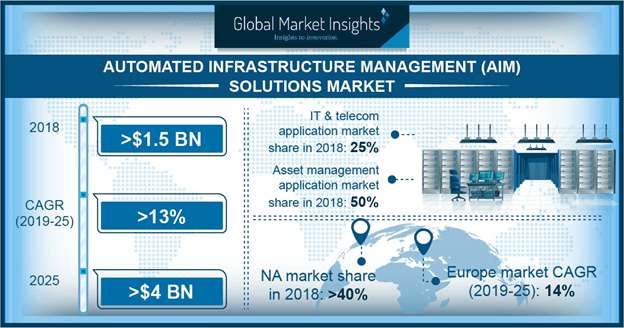 Automated Infrastructure Management (AIM) Solutions Market size was valued at approximately USD 1.5 billion in 2017 and will grow at a CAGR of over 13% from 2018 to 2024. Technological advancements in the IT sector and the growing demand for enhanced connectivity across data center facilities are expected to drive the automated infrastructure management solutions market over the coming years. The adoption of cloud, IoT, and automation in several industrial sectors has led to the development of centralized infrastructure management solutions for the effective management of IT assets. The data center industry is witnessing a rise in the adoption of these intelligent solutions in the modular and scalable IT infrastructure as these solutions help in reducing the cost and time required for managing the IT facilities. These factors are anticipated to positively impact the market growth over the coming years. Moreover, high investments by multinational companies including Facebook, Google, and Microsoft to implement hyperscale data centers for storing massive industrial data are expected to drive the automated infrastructure management solutions market growth. The ongoing trend of data exchange and automation in manufacturing technologies has led to an increased focus on developing the IT infrastructure that supports digitization and providing innovative quality management & control processes. With the technology changing the way in which the infrastructure is controlled and managed, the solutions are helping in providing the link between passive structured cabling infrastructure that connects network devices together and real-time network management tools. Incident management solutions are expected to grow at over 16% CAGR over the forecast timespan. They are being widely used and implemented for identifying the faults and errors in the cabling system and for managing the cabling connections in the infrastructure. They offer network managers automated monitoring and recording features for detecting malfunctions in the network connections. The automated infrastructure management solutions market is witnessing a rise in the demand for intelligent scanners and hardware components, providing managers control and visibility of the active equipment and cabling connections. The adoption of these solutions in data center facilities is growing at a rapid pace owing to the rising concerns for data loss and recovery of the lost information, thereby providing an impetus to the market. Device discovery segment in the automated infrastructure management solutions market is also witnessing a high demand from the BFSI and IT & telecom sectors owing to the rising complexity in the cabling and connections of the infrastructure facilities. The rise in errors and faults in manual arrangement and management of the connections by the operators have led to the adoption of automated device discovery solutions thereby driving the AIM solutions market growth. These solutions offer several benefits such as the real-time view of network connectivity, automatic upgrading & installation of new connections, and the documentation of the status & report of the functioning of the ports and cables. Such advantages are driving the adoption of the effective cable management solutions, thereby positively impacting the automated infrastructure management solutions market. Increased demand from end-use industries, such as BFSI and IT & telecom, is anticipated to drive the automated infrastructure management solutions market growth. These sectors are witnessing a rise in the demand for data centers owing to the adoption of advanced technologies such as big data analytics and cloud hosting for business operational needs. The deployment of these solutions in the IT & telecom sector is simplifying the operator’s tasks of monitoring the status of the servers and equipment. The tools are allowing the administrators to collect relevant data, receive alerts and monitor the infrastructure. Moreover, they are helping in monitoring and managing the intricate network cabling and other physical infrastructure within an enterprise data center. With the data center industry accelerating, automation is expected to infiltrate the cable infrastructure, thereby driving the demand for AIM solutions market. The BFSI sector has witnessed a transition with organizations switching to digitalizing several processes. Financial institutions and banks are facing challenges arising from large volumes of data storage and processing, leading to a rise in the demand for storage facilities. The adoption of these management solutions in the facilities is an intelligent approach to physical layer management and provides network managers a control over the networks. It helps in reducing the time taken to deploy new assets, thereby saving operational costs. In 2017, North America accounted for over 40% of the automated infrastructure management solutions market share and is witnessing a substantial growth owing to the rapid growth in digitalization and adoption of colocation services. Countries including the U.S. and Canada are adopting advanced technologies for improving the effectiveness and productivity in several industrial sectors. Technologies, such as cloud computing and IoT connectivity, are digitalizing the industrial processes and operations. Moreover, the presence of global players in the IT & telecom sector and the rapid expansion of their customer base are driving the demand for effective data management solutions, thereby positively impacting the market. These companies are establishing hyperscale facilities for the storage and management of their massive amount of data. For instance, in June 2016, Microsoft Corporation announced the launch of two new data centers in Canada. Such initiatives are anticipated to provide several growth opportunities to the automated infrastructure management solutions market. Moreover, the automated infrastructure management solutions market is expected to grow at a rapid pace owing to the growing interest of several companies in establishing their infrastructure facilities in the country. These tools are helping perform several cabling operations and tasks effectively and efficiently. 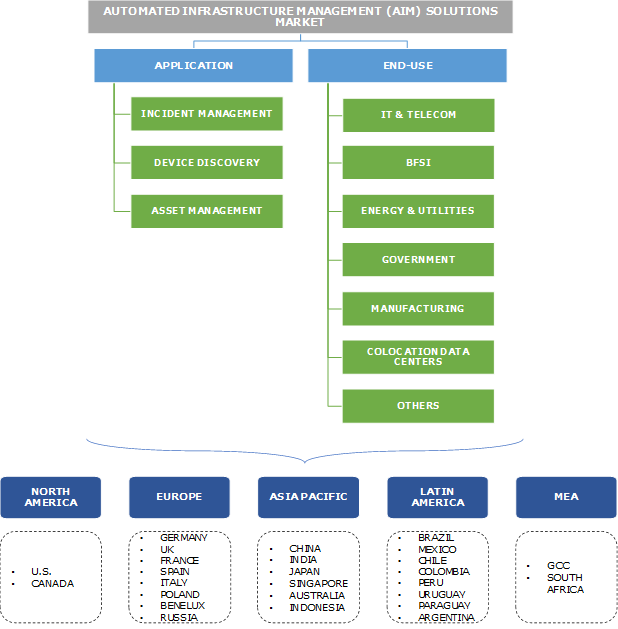 Key players operating in the automated infrastructure management solutions market include CA Technologies, Anixter International, CommScope, Inc., Cisco Systems, Inc., Fujitsu Ltd., Fiber Mountain, Inc., Hewlett-Packard Enterprise, Furukawa Electric Co., Ltd., Ivanti, IBM Corporation, Microsoft Corporation, METZ Connect, PagerDuty, Nexans, Reichle & De-Massari, Panduit Corporation, Rittal GmbH & Co. KG, RiT Tech (Intelligence Solutions) Ltd., The Siemon Company, and TE Connectivity, among others. These players are providing effective cabling management solutions for enhancing the networking and connections of the IT infrastructure facilities. Companies operating in the AIM solutions market are offering innovative tools for improving the efficiency and reliability in data management and security in several industrial sectors. A few established players operating in the automated infrastructure management solutions market are focusing majorly on providing their solutions to the IT & telecom and colocation sector. Suppliers in the industry enter into long-term contracts and partnerships with several industrial players to offer advanced software tools. These companies are focused on developing technically advanced and digitized products that support the stability of connectivity systems. Several players in the automated infrastructure management solutions market have developed innovative and stable connectivity systems and solutions for reliable data transmission in various public and private networks. Increasing automation in industrial processes is encouraging the developers for providing advanced automated cable management solutions. Real-time monitoring, data analytics, status update, and record keeping features are driving the automated infrastructure management solutions market growth. Moreover, increasing governmental awareness and regulations for data safety are driving the adoption of data center facilities, driving the adoption of these tools. Several European countries are adopting policies for the safety of the industrial data, which is anticipated to impact the market demand positively. In addition, the industry is witnessing a growing demand for DCIM tools, which is growing at a rapid pace. These tools are integrated with solutions and provide overall security and management of the infrastructure facilities. Companies are preferring to integrate both the tools collectively for the effective monitoring of the systems and connections. Moreover, players are developing innovative technologies to integrate the functionalities of DCIM into automated infrastructure management solutions market. Such technological advancements will help the companies in reducing their overall cost, thereby propelling the industry growth.